A tian is a type of gratin that traditionally does not have a bread crumb or cheese topping. A tian can also refer to a shallow earthenware casserole. Originally from the Alpes-Maritimes region of southeastern France, tians are popular across Provence and throughout France. 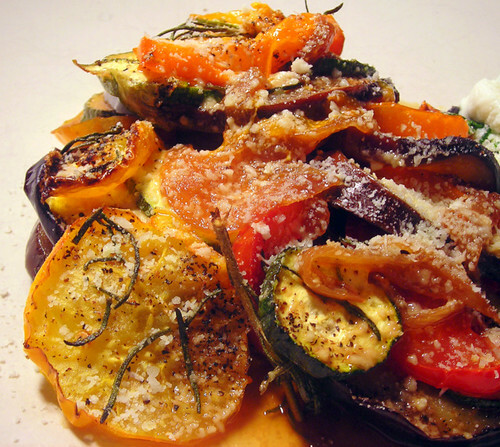 This particular tian features a variety of heirloom tomatoes, along with eggplant and zucchini. It has a base of slow-cooked onions that lends flavor to the finished dish. White wine, olive oil and herbs form a deeply flavorful sauce that bathes the vegetables as the casserole cooks in the oven. Serve with a salad and some fresh-baked bread for a light lunch or dinner. A dry white wine such as pinot gris or riesling would go well with this dish. Heat olive oil in a large skillet over low heat. Add onion and cook until caramelized, about 8 to 10 minutes, stirring occasionally. Spread in a 9″ gratin or round baking dish. 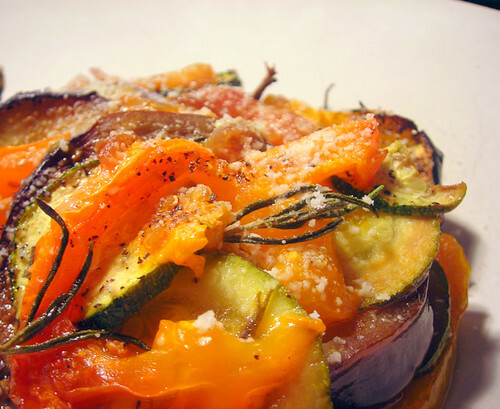 Arrange vegetables in slightly overlapping circles, alternating zucchini, tomatoes and eggplant. Top with wine, approx. 4 to 5 tablespoons olive oil, rosemary, salt and pepper. Bake for one hour or until vegetables are tender. Serve at once, passing cheese at the table. Time: 90 minutes, including prep. This is my submission for Weekend Herb Blogging #250, hosted by Graziana of Erbe in Cucina (Cooking with Herbs) and organized by Haalo of Cook Almost Anything. Weekend Herb Blogging is a weekly foodblogging event that was originally begun by Kalyn of Kalyn’s Kitchen. 09 Sep	This entry was published on September 9, 2010 at 1:24 am. It’s filed under food, French food, general, summer, vegetarian and tagged dinner, eggplant, heirloom tomatoes, lunch, main course, seasonal and local, vegetarian, zucchini. Bookmark the permalink. Follow any comments here with the RSS feed for this post. I didn’t know about tian, your recipe looks really interesting, thank you for joining to WHB! This looks like a fantastic dish. I’m thinking I have all these vegetables and should try something like this. Kalyn — There’s a seemingly infinite number of recipes for tians. It’s a great way to use up a surplus of vegetables. Thanks for visiting.